New York Interfaith Power & Light (NYIPL), a nonprofit organization of 90 congregations of different faiths, called on the Governor and the Department of Environmental Conservation in a letter Wednesday to prohibit high-volume horizontal hydraulic fracturing (�fracking�) until safety and environmental concerns have been addressed. New York Interfaith Power and Light also issued a new position statement on the issue. As people of faith concerned with climate change, said Executive Director Janna Stieg Watkins, NYIPL is particularly interested in the methane leaks associated with fracking. �Methane is a potent greenhouse gas� said Stieg Watkins, �and leaking methane is a serious issue.� Numerous other environmental and health hazards are products of fracking, the group noted. The Vice-Chair of NYIPL�s board, Dr. Patricia Townsend, said �If one applies the precautionary principle to the discussion, it becomes clear that it is inappropriate to open New York to fracking at this time, with the current state of drilling technology and environmental science. � The precautionary principle states that if a practice has a suspected risk of causing harm to the public or to the environment, that the burden of proof that it is not harmful falls on those promoting the practice. 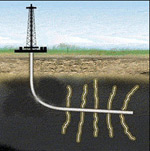 In this case that would be those entities promoting hydraulic fracturing.